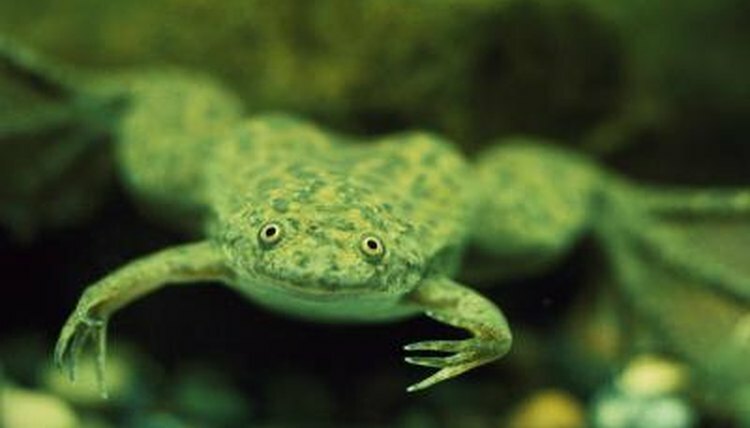 Amphibious frogs can live in water and on land. Regardless of where they spend most of their time, all frogs return to the water to lay their eggs. Their offspring's survival depends on it. Frog eggs require moisture or they will dry up and die. Frogs lay their eggs coated in a jelly-like glycoprotein. The jelly helps keep the eggs from drying out, but must maintain contact with a moisture source. Frogs can lay their eggs on pond vegetation, floating on the water's surface, or on the pond bottom. Many frogs lay their eggs in vernal pools, which are large, temporary puddles formed by spring rains. Adult frogs can survive on land and in water, but tadpoles can survive in water only. They have gills for underwater breathing and tails for swimming. If tadpoles hatched on land, they would not be able to breath or move around. Bird eggs have hard shells that protect the embryos from trauma. Because frog eggs are soft and moist, they require cushioning to protect the developing tadpoles. Water provides this cushioning. A few frog species, such as Darwin's Frog, watch over their eggs and guard them from predators. Darwin's Frog is primarily aquatic and would not be able to guard eggs laid on land away from the water.